Swiss horology found a second home in London during the early days of the 20th century. In 1905 businessman Alfred Davis and his German brother-in-law Hans Wilsdorf founded Wilsdorf & Davis at 83 Hatton Garden, EC1. Their company would eventually move to Geneva, rename itself as Rolex SA, and go on to become the most recognised manufactures in the world of watch making. Just a few years later – and a few doors away at 28 Hatton Garden – a British entrepreneur by the name of Claude Lyons was busy establishing another horological cult brand; Vertex. Serving governments, industry, armies, academia and healthcare, Claude Lyons had a thing for accuracy, measurement and mechanisation. Innovators in areas related to power control, his company became world leaders in the field of voltage stabilisers, transformers, power conditioning and uninterruptible power supplies, before moving into the business of wristwatches in 1916. Complete watches were at first imported from a variety of Swiss factories, initially as the Dreadnought brand (the cases for these and early Vertex movements were made in Birmingham by A.L. Dennison, the same American-founded case-maker used by the aforementioned Wilsdorf & Davis). But it was with the promise of “correct time, always’, some functionally handsome designs, a new agreement with the Waldenburg, Switzerland-based watchmaker Thommens Uhrenfabrik AG (and later, Revue Thommen) and the outbreak of the Second World War, that the Vertex brand forged its reputation. In the 1930s, when the Thommens factory diversified its business, making aviation navigation equipment and altimeters for Swiss and Austrian armies and supplying watches to the German military, Claude Lyons saw an opportunity. With the Second World War raging, Britain’s Ministry of Defence decided to kit out its army with reliable and accurate timepieces that could be synchronised and regulated for the increasingly tactical battle. Prissy, civilian watches were not considered sufficiently robust or dependable for front line action so the MOD invited Swiss manufacturers who could build a watch to its rigorous standards and strict specifications; waterproof, bomb-proof and luminous with chronometer-levels of accuracy. Twelve watch manufacturers took up the challenge and were eventually accepted. The so-called ‘Dirty Dozen’ included Buren, Cyma, Eterna, Grana, Jaeger Le-Coultre, Lemania, Longines, IWC, Omega, Record, Timor… and Vertex. Designed for practicality and maximum legibility, the Dirty Dozen watches were all required to look pretty much alike – black dials, Arabic numerals and a sub register dial with a second hand. The case-back was stamped with W.W.W. (standing not for “world wide web”, but “Watch. Wrist. Waterproof.”) with the ‘broad arrow’ graphic under the 12 as an official signifier of Crown property. Vertex thrived after the war, becoming one of the top 10 watch producers in Europe during the 1950s. But the dawn of digital and the impending quartz crisis forced Claude Lyons’ company to shut down its watch business in the 1970s. British horology’s premier military marque went missing in action. Now, exactly 100 years after its first, Swiss made, British-branded iteration, Vertex is back. 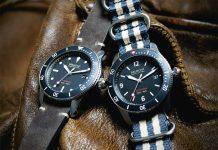 Entrepreneur Don Cochrane, great grandson of Claude Lyons, has resurrected the Vertex name, launching its first new watch – the Vertex Model 100 – in more than forty years.“ The Model 100 is a homage to the original Vertex Dirty Dozen watch,” explains Cochrane. “The case is larger – 40mm instead of the original 30mm – but with its Swiss-made ETA 7001 mechanical movement and the ‘broad arrow’ military mark signifying Crown property on the dial, there’s a genuine military narrative going on. It’s incredible to think how many critical decisions must have been made by men wearing Vertex watches over the years.” The price point for handsome, utilitarian chic is around the £2,500 mark. Ergo, Cochrane has launched Vertex as a sort of hyper-exclusive invitation-only, gentleman’s club watch, drawing up a list of 60 names of Vertex-redux early adopters and brand ambassadors. After purchasing their watches, these 60 names – “the kind of interesting, creative people you’d like to sit next to at a dinner party” – were encouraged to invite 60 more people to invest in a watch. Even access to the Vertex website requires a special code. 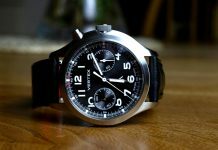 Vertex is hoping that the good name of the brand and the high quality of its product will spread by word of mouth and by people admiring it on other people’s wrists. Share the post "Vertex: Back in Action"
I have never heard of the brand before but what a great story!